Those who have played FIFA Mobile for some time might know that money, in the form of Coins, is not easy to come by. Sure, there are events that you can do over and over for a chance to win some cash, but these only appear at certain days of the week and, more often than not, will give you only the lowest prizes, as well as burn through your Stamina reserves to boot. Even if you manage to save up enough money for a player, you will only invest it in one card, and that’s it; your money’s gone; you’ll have to grind all over again to get more money for a new card. There must be a better way to do it, right? Well, there are certain tips you could heed in order to speed up your money-making endeavors, but that’s not the point of this article, in particular. Instead, by refining your search expertise in the market, you could also find some top-notch players that usually go for very cheap in the Market. On the other hand, you could just read this guide and find out who they are! Not to be confused with football Superstar Pelé, first on our list is Yohann Pelé, a goalkeeper currently signed with Marseille in Ligue 1. He has a very decent value of 74 OVR and can be found at varying prices in the Market. He can be obtained from any card pack that could possibly contain a Gold player, though you’re much better off purchasing him from the Market, where he can be bought for around 20,000 Coins. Furthermore, he comes with a skill boost to GK Positioning, which makes him a great goalkeeper, despite his average OVR. This one’s a bit trickier to find in the Market for a decent price, but he’s well worth the search nonetheless. You have to try over and over to find it because it’s just such a good card. Arthur Masuaku is a French football player currently signed with the English club West Ham United, where he plays as a wing-back or left back. His LWB card features a modest 75 OVR, but with a Balanced Boost which can be upgraded to further increase his OVR. In terms of skills, he’s a very balanced player, with mastery over long, precise passing, and with a keen eye for defending. His card is a bit more expensive than usual but, with some patience, you can usually find some good deals for him. His card is currently at around 70,000 Coins on the Market. 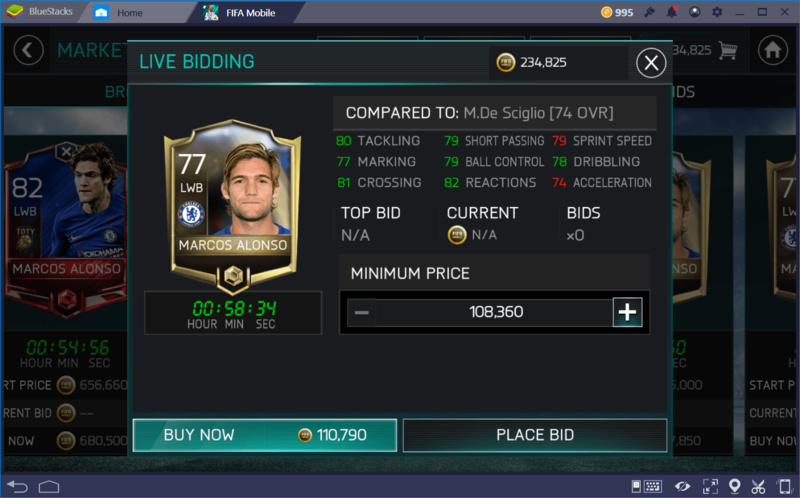 It seems people have already started to pick up on the quality of this card, as his price is steadily climbing day after day. Marcos Alonso is a starter for Chelsea who plays as left back or wing back. He started his career in the prestigious Real Madrid, but went on to other clubs after his contract ended, including the Bolton Wanderers, and then to Fiorentina, after which he landed a contract with his current club. In FIFA Mobile, his card is currently worth around 100,000 Coins but is usually well worth the investment if you have need of an aggressive defender that can single-handedly stop counterattacks. At 73 OVR, you might think that this player is worse than what you already have and, in most cases, you’d be absolutely right! Timo is a Dutch football player who is currently signed with Sassuolo in Serie A, where he currently plays as a defender. 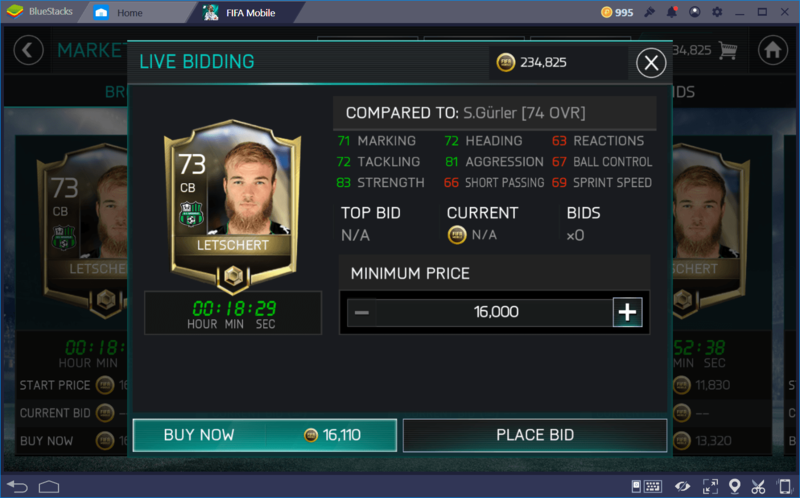 This is precisely where he shines in FIFA Mobile, as he has very decent attributes for defending, as well as coming with a Defense Boost that can be upgraded. Furthermore, at 15,000 Coins in the Market, you basically can’t go wrong with this purchase! Mahmoud is currently signed with Borussia Dortmund, where he plays the position of midfielder. In FIFA Mobile, he’s been gaining some popularity, as you can tell by his card increasingly becoming more expensive in the Market. With an OVR of 75, he can come across as painfully average at times. However, his excellent attributes for short passes, ball control, dribbling, and positioning, make him an absolute beast for supporting strikers, or even scoring himself. If you buy this guy, don’t be afraid to make him bob and weave through the enemy defense, and even taking a shot or two from outside the goal area; his long shots are precise and dangerous. The next few players will be a bit on the expensive side due to the positions they occupy. ST, LW, RW, and CAM like Sabitzer here tend to go higher on the market since they’re the ones that usually score and win matches for you. Case in point, Marcel Sabitzer is an Australian football player signed with RB Leipzig, where he currently plays CAM. As your central attacking midfielder, Sabitzer has a very good pace and shooting attributes, which usually allow him to speed right through the middle and score, or pass the ball to other players to land an assist. You can find his card in the market for around 100,000 Coins that are well worth the investment if you’re looking to win most of your Attack Mode matches. Hands down one of the cheapest ST you will ever find in the Market. Santini is a Croatian professional football player currently signed with Stade Malherbe Caen, where he plays as, you guessed it, a striker. Now, his attributes are not something you could write home about, but his shooting skill is definitely noteworthy. Furthermore, he comes with an acceleration boost that can be upgraded. At a meager price of 10,000 Coins, this is a no-brainer. There are tons of players available for purchase at the market. So much that making a list like this one is actually putting ourselves out there to get roasted by others who may have better players in mind. If this is the case, feel free to share your suggestions on the comments below so that we, too, can find better deals to strengthen our squads. The BlueStacks team will definitely appreciate your contributions!